Today’s recipe comes at warp speed to you with not one, but two vegetables and a protein! I know, you’re thinking that sounds really healthy Gerry, thanks. But while kale is one of the veggies, the other is a potato and the protein is pan-fried bacon. 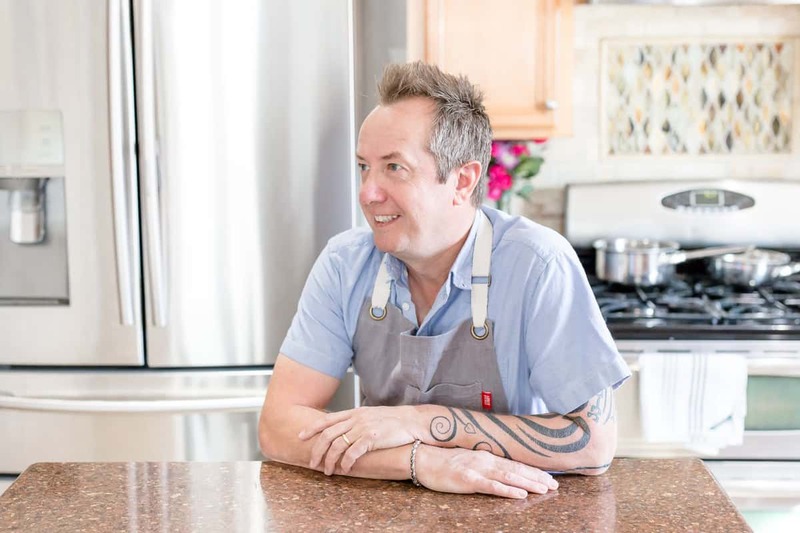 The Irish dish, Colcannon isn’t trying to be healthy. The obnoxious amounts of cream, butter, and cheese sort of blows that idea out of the water. As a food blogger, I’m always checking off the seasons and special holidays throughout the year. As soon as one passes, another is right there waiting for it’s 10 minutes of screen time fame. We just put Valentine’s Day to bed, so let’s make some space for St Patrick’s Day with it’s Guinness Battered Onion Rings and crusty Irish Soda Bread. Seriously, are we already talking about March, I swear my life is on fast forward. 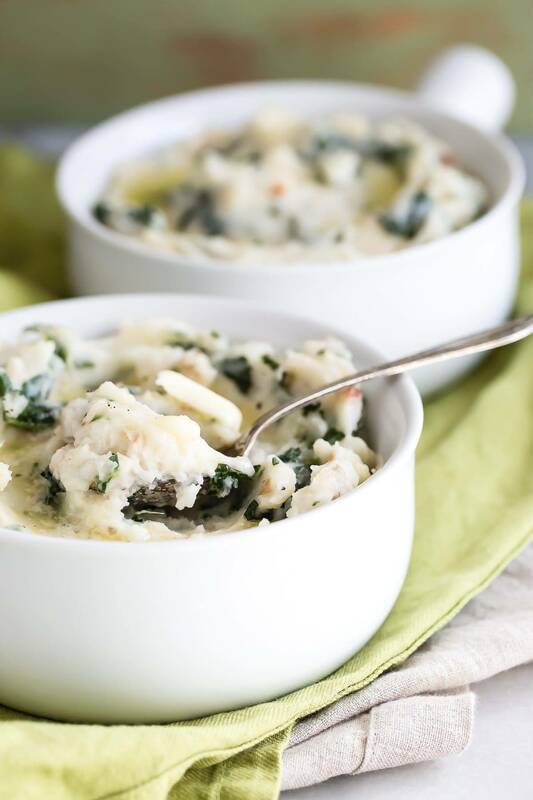 St Patrick’s day is full of comfort recipes, slow cooked corned beef, Irish stew and this creamy, cheesy Colcannon are just three of my favorites. 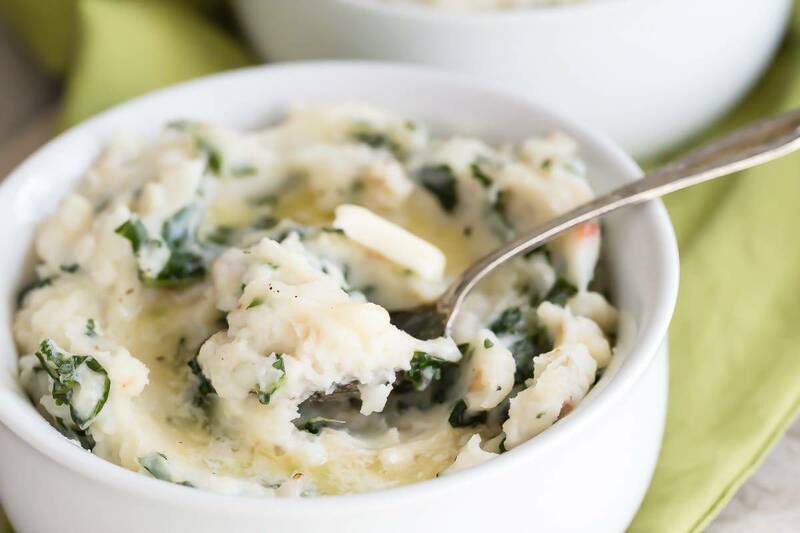 Colcannon is a traditional Irish side dish usually made up of mashed potatoes with kale or cabbage mixed through. Am I the only person that thinks mashed potato is like a secret code word for dairy dumping ground. It embraces copious amounts of butter and cream and in this case, greek yogurt to help make it taste awesome. But there’s a bunch of kale in there too, so no hate mail guys It’s all about balance. Those tiny flecks of brownish-orange color are crispy bacon nuggets, just to make sure we completely blow the calorie count sky high. A final mention to the cheese, Cabot’s Alpine Cheddar is strong and sharp and melts like lava. Balance…and lovely green kale. Focus friends. 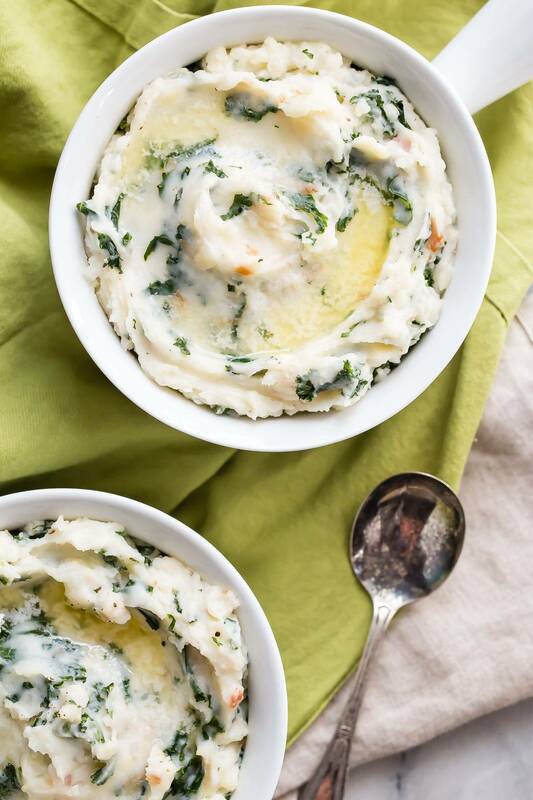 Creamy mashed potatoes with butter, greek yogurt, kale and crispy bacon. 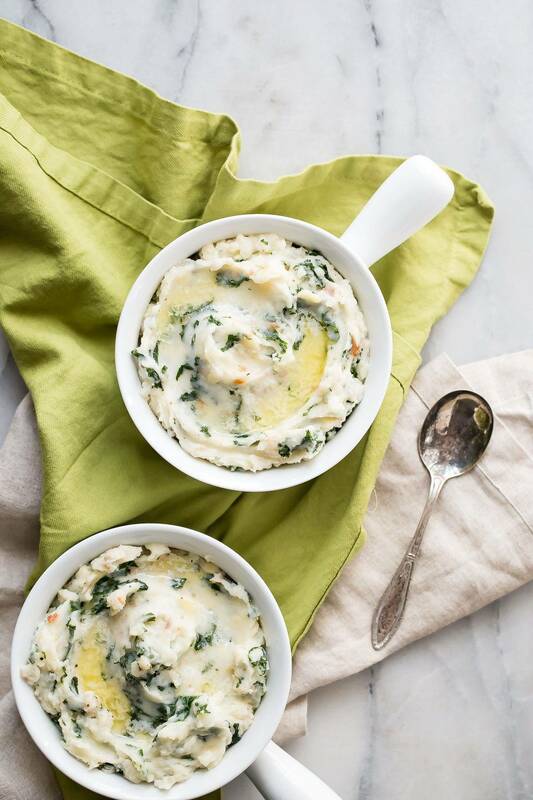 This is the perfect traditional Irish Colcannon dish for your St Patrick's Day dinner. Bring a large pot of water to a boil and drop the potatoes into it. Boil the potatoes until they can be easily pierced with a sharp pointed knife, about 30 minutes. While the potatoes are cooking, chop the bacon into dice and cook in a pan until almost crispy. In another large pan bring the water or stock to a simmer, add the chopped kale and cover with a lid. Beat until smooth and there are no large lumps visible. 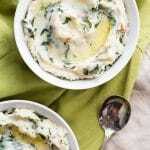 Add the Greek yogurt, butter, cheese and cream. Mix until all of the dairy is well combined. Add the cooked bacon and nutmeg and mix. Fold in as much of the cooked kale as you desire. Serve warm, can be reheated in the microwave. Healthy or not, this looks so good! You had me at kale and bacon!! I love the look and sound of this! Also, BACON! This looks so good! Better than mashed potatoes.